Amidst the excitement of our latest wine program at Whole Foods Market; Point of Origin / Italy, I was able to sit down and spend some time with this 2012 Tuscan red. Reading about the Verrazzano Castle and vineyards on their web-site I was surprised to find that official documents of the XIVth century describe the vineyards and the olive groves of Verrazzano. Giovanni da Verrazzano, celebrated navigator and discoverer of the bay of New York and the majority of the east coast of America, was born here in 1485. The famous bridge in New York was named after him in 1964. 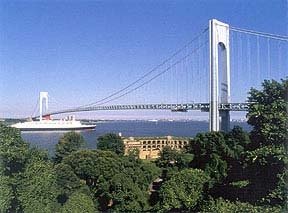 Proud to say I have had the honor of experiencing the Verrazzano Bridge first hand. This compelling Red from the Chianti Classico region revives the old tradition of including white grapes (Trebbiano and Malvasia) in the blend, softening the vibrant juice of the red grapes. Complex aromas of youthful fresh fruits and violets. 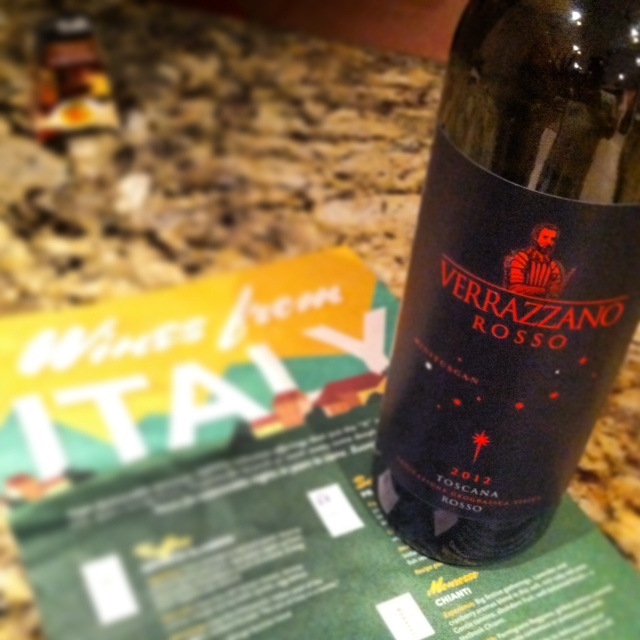 Tuscan herbs, black currant and pomegranate flavors move to a smooth finish. This wine using mostly Sangiovese with lesser quantities of Canaiolo, Trebbiano, Malvasia and Merlot was produced in Greve, Chianti. The soil is mostly limestone and the harvesting is done by hand. The ten month aging process was done in large Slavonian oak barrels followed by 3 months in bottle. For additional information on Slavonian oak check out Dr. Vinny of Wine Spectator by clicking here. On the nose; red fruit, floral [violet] and some vanilla with light resinous wood [oak, vanilla]. On the palate I found that this light/medium bodied wine had a very nice fruity balance and paired wonderfully with a tomato sauce based dish we were having. As the wine opened and breathed it was interesting to note the fading of the fruit to the background with a peppery spiciness evolving to the forefront. Both aspects were welcomed. I enjoyed the fact that this wine had character as it developed. I have found myself recommending it to customers ever since. More importantly we’re experiencing customers returning for repeat purchases. Regularly priced at about $16.00 and sometimes available as low as $12.00 this new wine for Whole Foods Market North Miami is being discovered quickly. To new wine discoveries! ¡SALUD! Eclectic and dynamic red wine, ruby-red colour with purplish reflexes, very harmonic taste, round, of good intensity with fragrant notes of flowers and red fruits. Attractive, pleasant wine, well suited to contemporary “fusion” cuisine. Wonderful post! It’s nice to spend time with and get all the details of the wine. You do it well.